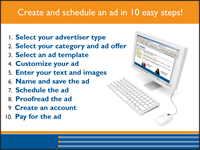 The Ad Wizard system sells profitable print display ads into newspapers and magazines. Post a link to The Ad Wizard on your web site, invite your community to "Place an Ad", and you too will sell print display ads with the click of a mouse. The Ad Wizard is a template-based display ad building system for newspapers and magazines with scheduling, pricing and payment modules. Advertisers create their own ad, schedule it, get the price and pay. The newspaper receives a press-ready PDF, and insertion order and the payment directly deposited to its bank. Ad Wizard systems include a complete set of management pages for the publication, and a complete ad history for the advertiser. Easy to set up, easy to use for your customers and your staff, no servers to buy, manage or maintain, no extra staff, or software - it's a web site, built especially for your newspaper, branded to your paper's style, with your paper's custom URL. The Ad Wizard has been in use by major market metropolitan dailies and small market weeklies since 2002, and has sold more than $30,000,000 in print display ads including over $9,000,000 in automotive and real estate photo-listing ads. 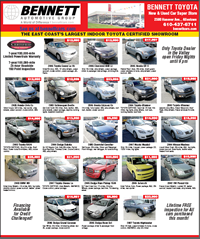 Currently selling more than 5,200 ads per week in auto, real estate and retail display ads in print and online. Link up from your web site with the words "Place an Ad". Are you getting your share of display ads from the web? Not sure? Take the tour! Our 60-second demo shows just how easy it is for an advertiser to create an ad from their computer. Browse a gallery of actual real estate, automotive and retail ads created online by clients.